it’s been a little while, my honest and righteous readers, and here i strike back with another review. this time i am again stepping out of the wide video-saving science into the shallower but still complicated branch of saving videos as mp3s, i.e. when you seeing this awesome track you want to have, but hate the video, or just have no room for it on your smart iphone, – this is your way out! 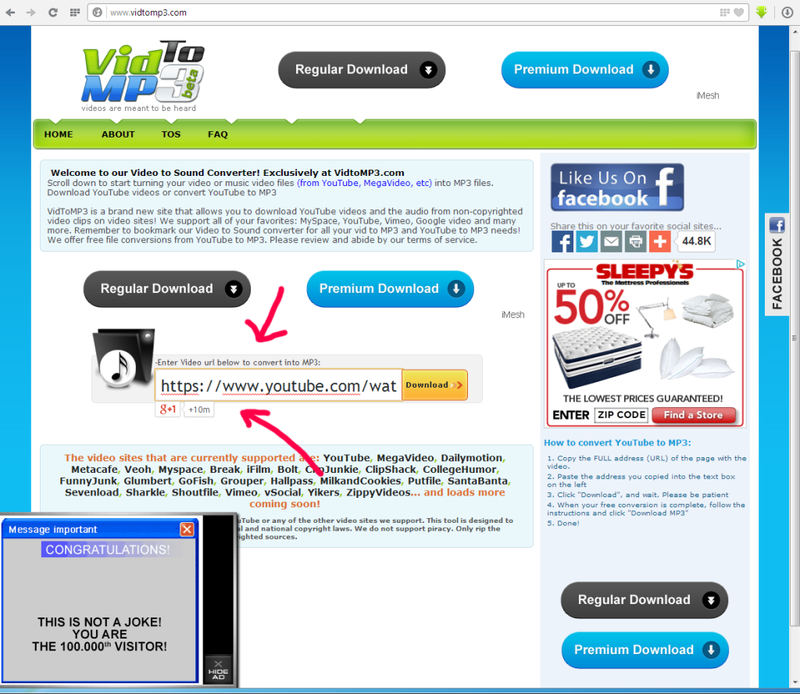 use mp3 converter and you’re all set! into the box. why i made such a huge screenshot for such a mere function? to show, that the page actually has 5 visible advertisement areas, the left bottom one is an intrusive popup… this a big turndown for me. and yes, my sites, as this one, are full of ads as well. but oh well, sometimes i am thinking like a simpleton consumer… who, i’d assume, won’t like this… there are also instructions on the right there. and now we do the usual steps, but in this case they are a bit extented with 2 extra ones.. this screen actually shows quick while the site is thinking on how to help you one.. ListenToYoutube is great too. left or right click and save as, and you’re having your track. after a few repetitions, this whole process won’t take more than 2-3 minutes, so don’t worry if first attempt fails.. and after the click, we can see the file starts slowly going into my computer..
so all in all, i wouldn’t recommend this service. they are saying that all income goes to charities and paid back for server support and rent, but i doubt they have much left, those ads are intrusive and useless, i mean, on a grand scale of a site from top 3000 sites in the world, oh yes, it works out fine. but ads are cheap, these aren’t google ads, they don’t pay much.. anyways, i would still use savefrom.net and gotten the mp3 directly from youtube. giving this method 3 stars.. not good enough and overly commercialized.